Malcolm Gladwell, the #1 bestselling author of The Tipping Point, Blink, Outliers, and What the Dog Saw, offers his most provocative---and dazzling---book yet. Three thousand years ago on a battlefield in ancient Palestine, a shepherd boy felled a mighty warrior with nothing more than a stone and a sling, and ever since then the names of David and Goliath have stood for battles between underdogs and giants. David's victory was improbable and miraculous. He shouldn't have won. Gladwell begins with the real story of what happened between the giant and the shepherd boy those many years ago. From there, David and Goliath examines Northern Ireland's Troubles, the minds of cancer researchers and civil rights leaders, murder and the high costs of revenge, and the dynamics of successful and unsuccessful classrooms---all to demonstrate how much of what is beautiful and important in the world arises from what looks like suffering and adversity. 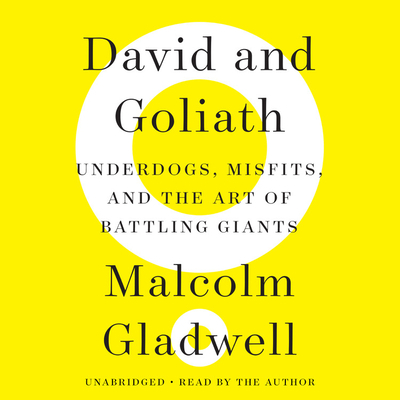 In the tradition of Gladwell's previous bestsellers---The Tipping Point, Blink, Outliers and What the Dog Saw---David and Goliath draws upon history, psychology, and powerful storytelling to reshape the way we think of the world around us. Malcolm Gladwell has been a staff writer at The New Yorker since 1996. He is the host of the podcast Revisionist History and the author of The Tipping Point, Blink, Outliers, and What the Dog Saw. Prior to joining The New Yorker, he was a reporter at the Washington Post. Gladwell was born in England and grew up in rural Ontario. He now lives in New York.